Most of the things that can affect your smile don’t have to be a permanent hindrance. For instance, if you develop gum disease, then you have an excellent chance of restoring your healthy gums with specialized treatment. 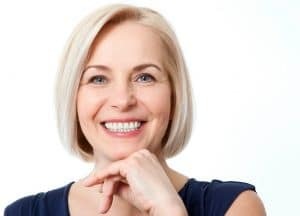 Even if you’ve lost one or more teeth to the disease, then your Encinitas/San Diego periodontist can help your smile bounce back by custom-designing a durable, highly lifelike replacement for them. Gum disease is the most common cause of adult tooth loss, and if it’s the reason behind yours, then your first step will have to be to address it. That’s because the disease will continue to affect the vital periodontal tissues and jawbone structure that support your teeth, and that will be responsible for supporting your prosthesis. If you’ve lost teeth for another cause, such as accidental trauma, then you may require different treatment to ensure that your smile is prepared to accept a custom-designed replacement. In the case of gum disease, you may also require prerequisite treatment to restore and rebuild any structures that have been severely damaged. For example, your gums may be so affected that some of the tissues must be removed so that the healthy tissues can heal. If your jawbone has lost mass and density, then you require bone grafting to fortify it first, especially if your replacement teeth are going to be supported by dental implants. Once your oral health has been restored, your oral health specialist can focus on rebuilding your smile with a customized, highly lifelike prosthetic option. For instance, many patients benefit most from choosing a dental implant-supported crown, bridge, or denture (depending on how many teeth they’ve lost). The implant posts that support the prosthesis will offer the most lifelike support, as well as the vital stimulation that you’ll need to preserve the health and integrity of your jawbone in the future. If you’ve suffered tooth loss, then learn how you can bounce back and regain the healthy, beautiful smile that you deserve. For more information, schedule a consultation with Dr. Kania by calling her periodontal office in Encinitas/San Diego, CA, at (760) 642-0711.